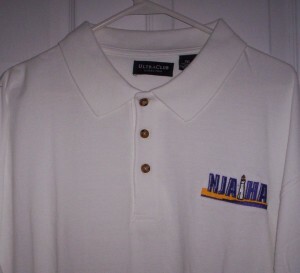 The NJAIHA has begun a student scholarship initiative by promoting the sale of white short-sleeve polo shirts with the NJAIHA embroidered logo stitching. All of the proceeds from the sale will help support a worthy student scholarship for those individuals studying industrial hygiene / environmental health and safety in New Jersey. Orders can be placed by filling out the form below, by mailing in this Polo Shirt Order Form along with a check, or while attending the monthly dinner meeting or other NJAIHA sponsored event. Payment Instructions Submit form and complete payment through PayPal. Please verify the correct payment amount on the PayPal site. Pricing is as follows: [XS - XL: $35/shirt] [2XL: $37/shirt] [3XL: $38/shirt] [4XL: $39/shirt] [5XL: $40/shirt] [6XL: $41/shirt] Please remember to add $10 to your order if you chose to ship above. Free pickup available at NJAIHA events.